This post is the fourth in Bondings 2.0’s reports from the Synod on Marriage and Family in Rome. New Ways Ministry’s Executive Director Francis DeBernardo will continue to send news and commentary from this meeting. Previous posts can be reached by clicking here. Yesterday was my fourth day at an afternoon press briefing for the synod. Fr. Federico Lombardi, the Vatican’s main spokesperson briefs the attendees, mostly representatives from the international press, and then turns the microphone over to two or three synod delegates to make brief statements of their perspectives on what has transpired, and to answer questions. I appreciated Palmer-Buckle’s honesty. He did not try to justify the stance of some African bishops who have remained silent about criminalization, or even sometimes tacitly and overtly supported it. He acknowledged that accepting homosexuality is a difficult cultural problem that must be overcome. He was also adamant that the Church should support the human dignity of gay and lesbian people, mentioning it at least twice in his response. By saying “we are growing,” he acknowledged that the cultural homophobia which may be normative is not the ideal Christian situation for bishops. He also seemed to be apologizing for the response of the bishops, saying that they were offended by the idea that aid to their countries would be tied to support for marriage equality. It must be pointed out, though, that supporting marriage equality and condemning criminalization of lesbian and gay people are two separate issues. According to church teaching, it would be extremely difficult for a bishop to support marriage equality, but, also by Catholic teaching, it would also be extremely easy for a bishop to oppose criminalization and the denial of human rights to lesbian and gay people. While I understand his perspective that homophobia takes time to heal, especially culturally, we must also remember that lives hang in the balance when homophobia mushrooms into criminalization and institutionalized violence. Overcoming one’s personal homophobia may take time, but we also have to remember that when homophobia becomes legalized, that people suffer greatly from this. While I understand his call for patience, I hope that he and others realize that the longer it takes to eradicate homophobia, the more LGBT people will suffer and pay the price with their lives. That is why a synod statement opposing criminalization is so important. 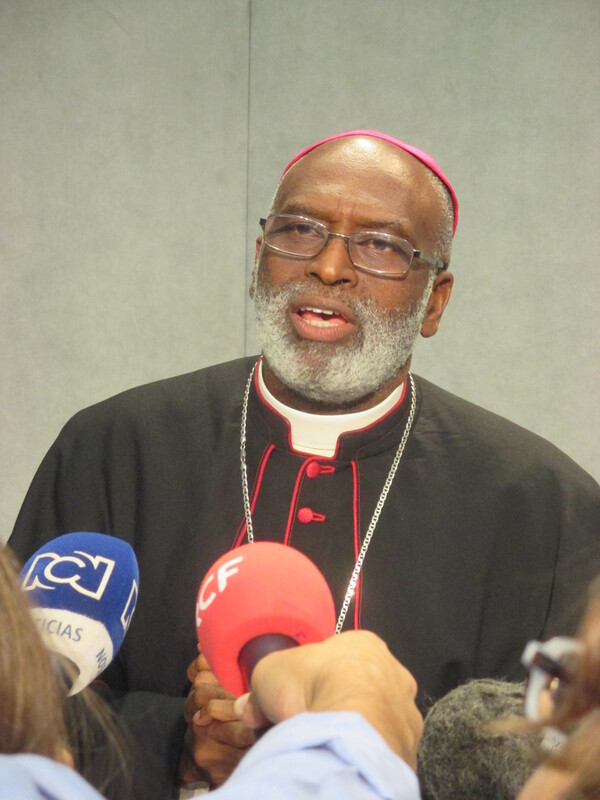 The African bishops have shown that they are blinded by their cultural and personal homophobia, and they need to be led by their brother bishops to enact justice by speaking out against criminalization. Justice demands it and lives cannot wait. Palmer-Buckle did not answer the question about whether the synod would issue a statement about criminalization. Perhaps it is too early in the process for him to be able to say anything with certainty about the matter. Yet, the synod has been urged to make such a statement earlier this year by the then-fledgling Global Network of Rainbow Catholics (GNRC). You can read about their recommendations by clicking here. A statement condemning criminalization seems like the theologically easiest thing for the synod of bishops to do in regard to pastoral care for LGBT people. Let’s hope and pray that the more open and honest attitude towards this situation exhibited by Archbishop Palmer-Buckle today will influence bishops who are more opposed to such a development. *Many thanks to Deborah Rose-Milavec, executive director of FutureChurch, a Catholic reform organization, who is also present in Rome, for transcribing the bishop’s answer for me so that I could listen attentively and courteously to his response. Deb is blogging about the synod on her blog, SynodWatch. Her reports are excellent, and can be accessed by clicking here. I appreciate your perspective Frank —– especially the differentiation between marriage and decriminalization – and also that path. It will be interesting to see where this goes. I have seen, and heard some terrifying descriptions of violence in Africa towards some gay people. The distinction must be made between an individuals sexual orientation and an individual actions. That applies for both homosexuals and heterosexuals. So the U.S. and European countries putting conditions of acknowledging human rights in order to receive aid is “violating the sovereignty of African nations”??? That money is a gift. These wealthier countries are being generous. The good bishop acts like the African countries have a right to this money. The West is under no obligation, and darn right they will abide by human rights standards if they want the money. Some Western countries have put pressure on a few African countries in order to prevent them from punishing homosexuals with death penalty and long-term prison sentences. That’s true. And as a Christian, I cannot see any problem with that. The Roman Church has an uncanny ability to declare itself the victim (both here and in the U.S. under the guise of “religious freedom) as a way to defend its immoral actions. Francis came too late. In Advance of the Synod, Global Network of Rainbow Catholics Launches In Ro... Will Language Be the Only Thing That the Synod Updates?